Those in management positions must develop a leadership style. The selection of the style is contingent on the leader’s personal traits, the people she will lead, and the nature of the activity. Rather than casting them as peripheral to the sport experience, club leaders and coaches should consider parents valuable resources who deserve to feel valued, respected, and central. Because the wants and needs of sport club consumers vary, there is no magic bullet or a cookie-cutter model for developing a sport club’s marketing efforts. A sport club needs to determine what elements are in its inventory and which ones it is willing to offer a potential partner to meet that partner’s needs. Sport Club Management provides readers with the knowledge and tools necessary for running a sport club like a business. Thought-provoking opening scenarios, revisited at the chapter’s end, draw readers in and invite them to consider how they would respond to similar situations. Successful Strategies sidebars discuss real-world examples of issues a club manager might face and how those issues were resolved. Numerous reproducible sample forms make it easy for readers to implement new strategies based on the administrative needs of their own clubs. 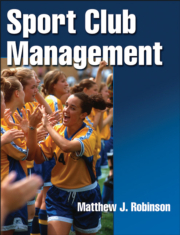 A professional reference for club sport administrators, coaches, and club managers. A text for higher education courses in sport club management and sport management and administration.